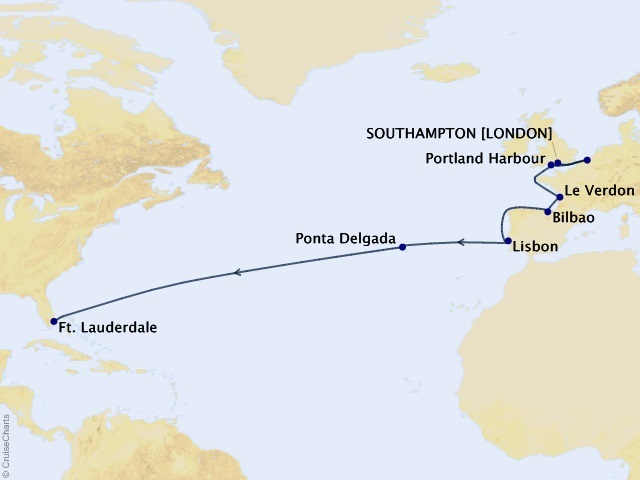 Departing from London (Southampton) on September 22, 2019, prices starting at $1,579. Enjoy sweeping views of the world while sailing on Crown Princess, one of the largest Princess ships. From her nearly 900 balconies to the breathtaking three-story Atrium, you'll discover a relaxing atmosphere filled with an array of world class entertainment and dining options that will greet you each day when you return from making fascinating discoveries ashore. Just like a restaurant at home, Anytime Dining℠ enables guests the freedom to dine when and with whom they wish, at any time between 5:30 pm and 10 pm. Reservations are available through an onboard dining hotline, but not required, and diners may choose to eat only with their own group or be seated with other guests. The choice is yours. There are few foods that inspire as much passion as chocolate, and master chocolatier Norman Love has designed some of the most decadent, hand-crafted treats exclusively for Princess’ Chocolate Journeys℠ program. Trained in France and named the Inaugural Inductee into the Chocolatier Hall of Fame by Dessert Professional Magazine, Chef Love combined premium quality chocolate with unique flavors and artful designs to mastermind his exclusive creations found in the main dining room and select locations on board. Open 24-hours a day, the International Café located in the Piazza is the place for an ever-changing array of small bite meals, treats and gourmet beverages. Grab a freshly baked croissant to start your day, snack on pies and quiche or choose from a wide variety of salads and sandwiches at lunchtime and indulge in decadent desserts in the evening. Coffee and tea fans will love the New Grounds Crafted Coffee menu featuring a variety of specialty espresso-based drinks made from a custom blend of coffee beans, as well as iced tea fusions. Horizon Court offers an endless selection that changes throughout the day, to satisfy the most discriminating palate. Indulge in a delightful array of worldwide cuisine, freshly baked breads and regional comfort foods, in a casual setting at breakfast, lunch or dinner. Enjoy fresh fruits, signature pastas and desserts galore along with your favorite beverages and customizable features like create-your-own salads and sandwiches. Beverage charges apply. 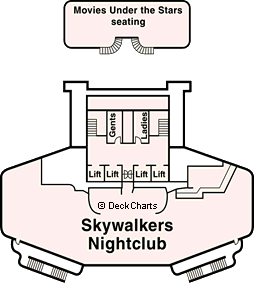 Venues and menu items vary by ship and are subject to change. Treat yourself to one of our 100% handmade Gourmet Burgers, including our Princess Burger or Triple Smoked Burger. The Salty Dog Grill also offers new Street Tacos – a Princess first – featuring a choice of grilled chipotle-lime chicken or roasted sweet potato-green chile. And don’t miss the Classic Hot Dogs, plus loaded fries in tempting varieties including chili cheese and bacon & cheese. Our top-deck pizzeria features a bold new look that sets the stage for tempting offerings that include specialties inspired by local favorites from the Pacific to the Atlantic. Try a Deep Dish Focaccia or a slice of our award-winning signature Neapolitan-style classics. Savor some California Artisanal Toast with Cali-Avocado or Caprese toppings. Or go for a Sliced Stromboli, and enjoy an East Coast take on a classic Italian calzone that’s stuffed with delicious Italian deli meats and cheeses. Complimentary ice cream cones await you at our transformed top-deck creamery venue. Pick up a chocolate cone, a vanilla, or a combination. Or treat yourself to an ice cream sandwich, with a tempting choice of flavors such as The Classic, Cookie Colada, Snickerdoodle, Honey ‘N’ Oats and Mint Paddy. We’ve added specialty New Grounds Crafted Coffee too. Including Espresso and Cappuccino, Latte, Chai Tea and more. You’ll even find a choice of Frappes, such as Nuts for Caffeine, Mocha Milkshake and Mexican Frothed Chocolate. Our Italian specialty restaurant has been voted one of the “Best Cruise Ship Specialty Restaurants” at sea by USA TODAY. Savor Sabatini’s authentic offerings featuring signature pastas, Italian wines and an irresistible selection of delectable desserts, all celebrating our Italian culinary heritage. Additional charges apply. Menu items may vary by ship and are subject to change. With a rich wood décor and a theater-style kitchen, it’s no wonder Crown Grill was named among the “Best Cruise Ship Steakhouses” by USA TODAY. Featuring premium aged beef and fresh seafood items, this specialty restaurant offers an intimate dining experience in a classically elegant setting and an open kitchen where chefs prepare and cook to order top-quality cuts of beef, chops and seafood. Additional charges apply. Taking dining to a new level, the Chef’s Table Experience includes pre-dinner cocktails and hors d’oeuvres in the galley for you and a limited number of fellow guests. After your executive chef describes the specially designed menu for the night, participants are escorted to an intimate table for the main course, including pairing suggestions. Each couple receives a personalized autographed copy of Princess’ best-selling cookbook, a handwritten copy of the special menu and a complimentary photo. Limited capacity, reservations required. Additional charge applies. Seafood lovers won’t want to miss this full crab shack experience. An intriguing bistro option housed within the Horizon Court buffet, Crab Shack diners can savor Bayou-style boiled crawfish and spicy sausage, popcorn shrimp, steaming clam chowder and a tantalizing mixed steamer pot filled with snow crab, jumbo shrimp, clams, and mussels. Cover charge applies. Voted one of the “Best Wine Bars at Sea,” by USA TODAY and located in a charming corner of the Atrium, Vines boasts an extensive collection of wines, like Opus One, Super Tuscans, fine sparkling wines and regional offerings for purchase. The menu also includes wine flights and a selection of wines by the glass. Gourmet delicacies, such as antipasti and tapas, are complimentary with any wine purchase. Charges apply. Our exclusive partnership with Discovery Communications™ lets you come back captivated with Stargazing on our top deck; activities featuring Discovery™ hit shows such as Shark Week and Finding Bigfoot; plus, our new Encounters with Discovery at SEA™ speaker series. Great art, like the destinations we visit, can be awe-inspiring. Peruse our extensive art gallery or attend an art history lecture highlighting some of the world’s greatest masters. And don’t miss our exciting Champagne Art Auctions, which give you the chance to view and bid on a wide range of fine art, including pieces by famous artists like Thomas Kinkade, Peter Max, and Michael Godard. There is no charge to attend these lively events. Throughout the day and night, our exclusive open-air poolside amphitheater is the go-to destination for feature films, thrilling concerts and exciting sporting events such as live football games. Cozy up under a fleece blanket in the comfortable lounger and feast on complimentary fresh-popped popcorn in the evening or delicious cookies and milk during the day. Princess Cruises brings all the excitement and spectacle of TV’s popular singing competition live and on stage with The Voice of the Ocean. The contest features blind auditions, mentor sessions, the iconic “I Want You” chairs, three charismatic coaches and a grand finale performance where guests choose the winner. There’s nothing like a Princess party to bring people together. Our Festivals of the World hosts onboard events that celebrate timeless traditions from nearly every corner of the globe. Parties and dancing, lively music and folkloric performances, enriching activities, themed movies and specialty shopping are just some of the ways our Festivals of the World come to life! From Oktoberfest to Rio’s Carnival, Festivals of the World is a gala event you won’t want to miss. On select sailings. Hot music and cool cocktails set to a DJ spinning popular club tunes is the ideal setting for a night of dancing. Gleaming, ultra-modern and ultra-cool, this hot spot invites a little stargazing while the colorful neon dance floor invites everyone to get up and boogie down. Boasting panoramic views from its vantage point 15 decks above the sea, it’s the perfect place for dancing and socializing. With your overall wellness in mind, we’ve collaborated with leading board-certified sleep expert Dr. Michael Breus and HGTV designer Candice Olson to create the ultimate in blissful comfort. Our luxurious new beds feature a scientifically engineered mattress and bed springs, a plush two-inch pillow top, European-inspired duvets and 100% luxurious Jacquard-woven linens-to assure that at the end of your voyage, you come home feeling refreshed and renewed. To prepare our guests for the ultimate night of restful sleep at sea, we consulted with board-certified sleep expert Dr. Michael Breus to optimize our staterooms for a sleep-friendly sensory experience, from the bedding to even SLEEP-friendly evening meals on board. He explains, "Sleep is a sensory experience. In fact, all five of your senses must be prepared for slumber in order for sleep to come easily and last all night long." Take a break and indulge in a private getaway at The Sanctuary, the exclusive adults-only retreat offering a relaxing alternative to the myriad outdoor activities and entertainment available elsewhere on the ship. Named “Best Spa on a Cruise Ship” by Spafinder Wellness 365™, the Lotus Spa® offers a variety of relaxing treatments, and an aromatherapy thermal suite. Or get ready for a night on the town at the salon which features women’s styling color, men’s haircuts and shaves, manicure and pedicure choices and teeth whitening. The Lotus Spa® Fitness Center offers fitness programs designed to help you maximize your wellness with Tour de Cycle, personal training and classes such as Pilates, Yoga, and Body Sculpt Boot Camp. The Lotus Spa Fitness Center also features state-of-the-art equipment, so you can tone on your own. Even the littlest guest will delight in this whimsical, forest -themed world that inspires playtime and invites exploration. Kids, ages 3 to 7, can dance, enjoy pajama movie nights, create art projects like Animal Planet puppets and masks or compete in a Lego® boat-building contest. Inspired by the great outdoors, this cozy center keeps kids busy with games, dancing, and kid-sized Olympic competitions. Their minds stay busy, too, with California Science Center programs like rocket building, exploring outer space with Stargazing, and learning how to build a model roller coaster. This contemporary lounge is "the place” for teens — perfect for hanging out and socializing with late-night movie viewing, hip hop dance classes, video game tournaments and sports competitions like dodgeball and basketball. Princess makes it easy to sail together in comfort. 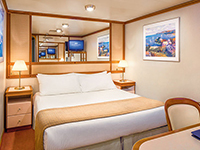 There is a wide selection of staterooms accommodating up to four guests, and you’ll enjoy substantial savings on your third and fourth guests. 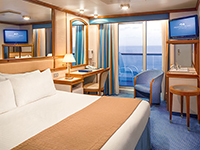 There are also connecting stateroom options, as wells as Two Bedroom Family Suites, with room for up to eight guests, which offer more living space, a balcony and two bathrooms, including a full bath tub. Approximately 687 sq. 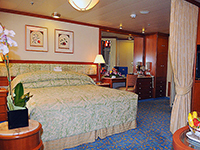 ft. including balcony, the Owner's Suite features an expansive cabin and oversized aft-facing balcony. Enjoy exclusive suite-only upgrades and benefits. Approximately 524 to 531 sq. 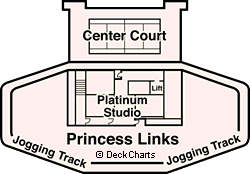 ft. including balcony, the Penthouse Suite features a spacious cabin and aft-facing balcony. Enjoy exclusive suite-only upgrades and benefits. Approximately 533 sq. ft. including balcony, the Penthouse Suite features a spacious cabin and separate seating area with a sofa bed. Enjoy exclusive suite-only upgrades and benefits. Approximately 568 sq. ft. including balcony, the Premium Suite features a spacious cabin and separate seating area with a sofa bed. Enjoy exclusive suite-only upgrades and benefits. Approximately 460 to 495 sq. 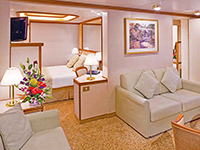 ft. including balcony, the Vista Suite features a spacious cabin and aft-facing balcony. Enjoy exclusive suite-only upgrades and benefits. Approximately 606 sq. 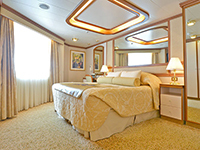 ft. including balcony, the Family Suite features 2 bedrooms to accommodate up to 8 passengers. Enjoy exclusive suite-only upgrades and benefits. Approximately 323 sq. ft. including balcony, this spacious cabin provides a seating area with sofa bed, and full bath with combination tub and shower. Approximately 271 sq. ft. including balcony, this cabin provides outstanding views from a private balcony. Approximately 240 to 298 sq. ft. including balcony, this cabin provides dramatic wake views from a rear-facing private balcony. Approximately 179 sq. 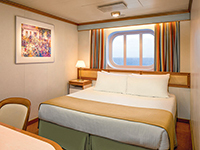 ft., this well-appointed stateroom features a picture window for memorable views. Approximately 179 sq. 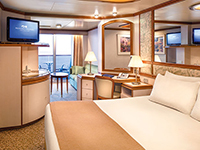 ft., this well-appointed stateroom features either a picture window or rear facing porthole for memorable views. Approximately 179 sq. ft., this well-appointed stateroom features a picture window with an obstructed view. Approximately 162 sq. 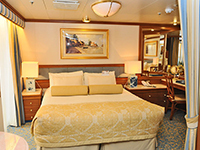 ft., this well-appointed interior stateroom provides fine amenities. 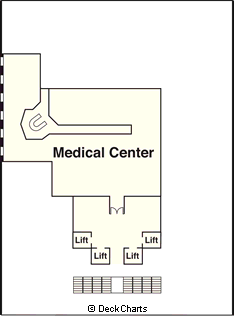 Approximately 162 to 182 sq. 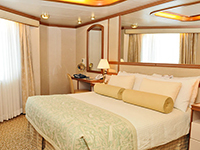 ft., this well-appointed interior stateroom provides fine amenities. Approximately 158 to 179 sq. ft., this well-appointed stateroom features a picture window with an obstructed view. Approximately 231 to 271 sq. ft. including balcony, this cabin provides outstanding views from a private balcony. Approximately 231 sq. ft. including balcony, this cabin provides outstanding views from a private balcony.